The City of Missoula currently owns and operates 5 certified flood control facilities, including 4 certified levees and 1 high hazard dam. To function as designed these require regular maintenance. With the October 2016 formation of the Storm Water Utility the City of Missoula is beginning to tackle long-deferred maintenance on these facilities. Learn more about Missoula's levee system operations and maintenance. 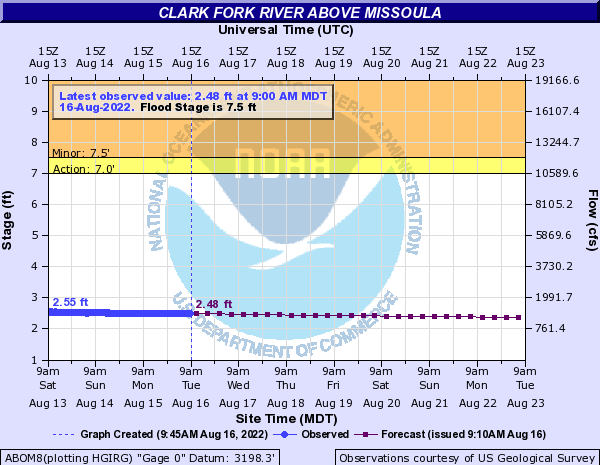 For questions on Missoula's flood controls call the Storm Water Division at 406-552-6358. The levees are designed and built for 100-year flood events. City Storm Water Division staff and the City Engineer inspect them twice a year. They completed the spring inspection in April 2018. Every other year, staff from the Army Corps of Engineers join the inspection with City staff. The Orchard Homes levee is a Missoula County levee. Find a levee near you with the help of US Army Corps of Engineers. Low-lying or poor-draining areas may be inundated from river flooding, runoff, or an over-saturated groundwater table. As always, prepare and stay informed for coming flood conditions. See the links below. If your property is at risk of flooding, stay informed about local conditions and the resources available to you. 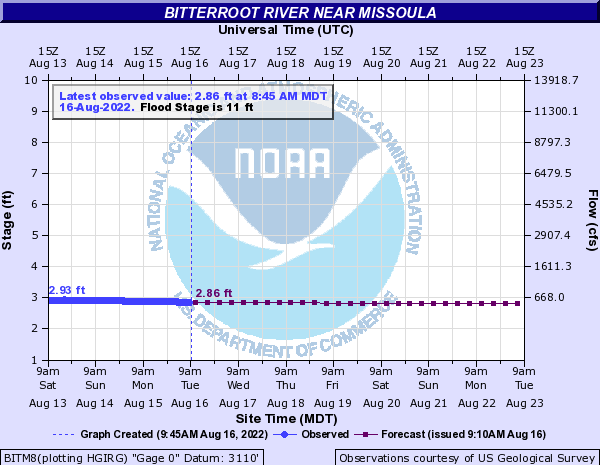 Missoula County Stream Monitoring Stations current river gauge information operated by the USGS. Floodwaters can cause wastewater to surface or to back up into houses on septic systems. If there is any sign of floodwaters backing up into a house, residents should clean and disinfect the area before using it. Residents also should not pump flood or groundwater into floor sinks or house drains, as that amount of water can overwhelm septic systems, leading to sewage surfacing on the ground or backing up in a house. If you see this on your property, the best solution is to plug all drains in the basement and drastically reduce water use in the house. Review the EPA's resources on septic system failures and their fact sheet on what to do once the flooding starts. See the Missoula County Health Department's tips on flooded wells, safe drinking water, and chemical storage. To safeguard against contaminated floodwaters (which may contain chemicals, sewage, bacteria, and viruses) the Health Department recommends residents ensure their tetanus shots are up to date. Prior to eating ensure your family's hands are washed with soap and water. This will help reduce risk to waterborne illness. Turn Around Don't Drown flood safety information from the National Weather Service. The National Flood Insurance Program operated by FEMA.